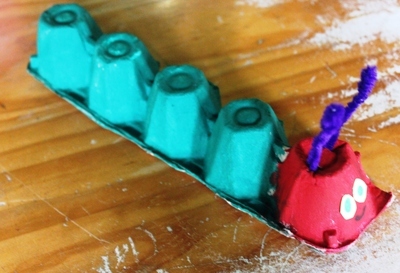 This is a great way to use up old egg cartons and create a cute toy based on the extremely popular children's book, The Very Hungry Caterpillar by Eric Carle. Young children will especially find this activity fun and they can paint their caterpillar all by themselves too. Eat a dozen eggs and save the egg carton. 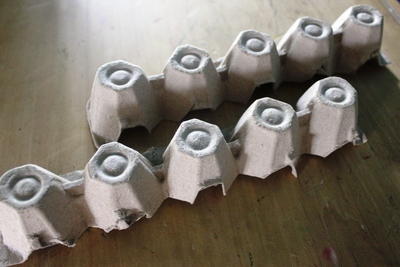 Cut the egg carton in half down the middle, to form The Very Hungry Caterpillar's "body". 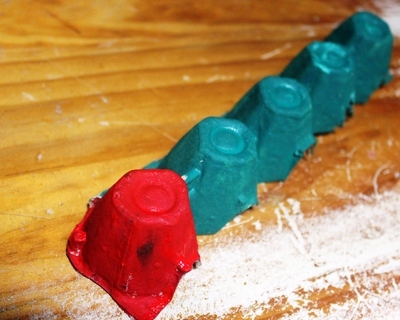 Turn the egg carton upside down and paint the first five "lumps" a dark green color. 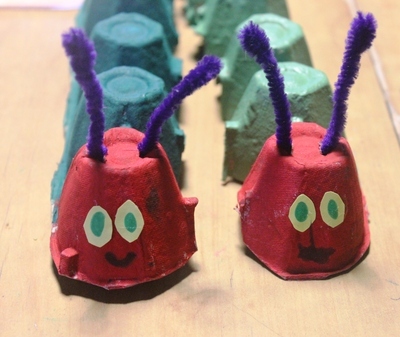 Paint the remaining "lump" a bright red color to form the Very Hungry Caterpillar's "head". Allow the paint to completely dry and poke two holes through the red "head" where the antennae will soon fit through. Trim the edges of the carton around the head and tail to make them smooth looking. Take the purple pipe cleaner and poke either end up through the holes in the "head". Cut two small oval shapes in the yellow paper and paint two green spots in the center of each, to form The Very Hungry Caterpillar's "eyes". Also draw on a mouth and/or a nose. Now your own Very Hungry Caterpillar is ready to eat lots of plums, apples, strawberries, oranges and all the rest. Have fun and maybe make some more? 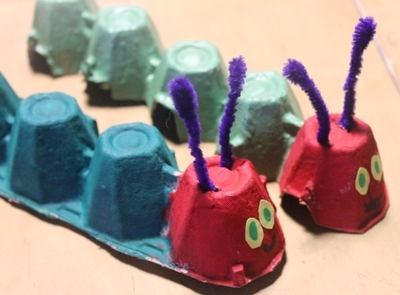 My son loves The Very Hungry Caterpillar so I'm sure he would love making these.